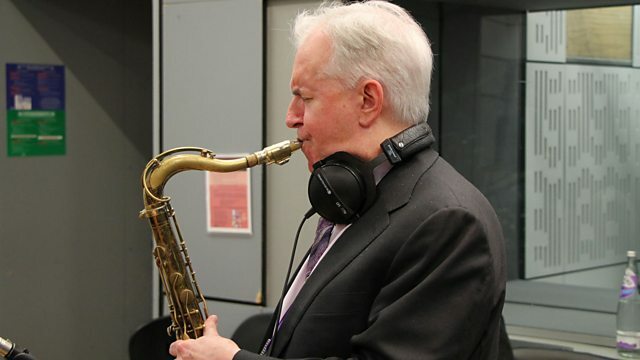 Sean Rafferty with a live performance from saxophonist Scott Hamilton and his Quartet, and soprano Sylvia Schwartz. Plus an interview with Anna Netrebko and Yusif Eyvazov. Sean Rafferty with a lively mix of chat, arts news and live performance. His guests include soprano Sylvia Schwartz and pianist Malcolm Martineau, who perform live ahead of their upcoming recital at Wigmore Hall, and the Scott Hamilton Quartet, who are in residence at PizzaExpress Jazz Club over the Easter weekend. Plus an interview with opera stars - and husband and wife - Anna Netrebko and Yusif Eyvazov, who perform together at the Royal Opera House and the Royal Albert Hall over the coming weeks. Conductor: Sakari Oramo. Orchestra: City of Birmingham Symphony Orchestra. Sibelius: Symphony No.5/Karelia Suite etc: City of Birmingham Symphony Orchestra. Singer: María Cristina Kiehr. Ensemble: Schola Cantorum Basiliensis. Conductor: René Jacobs. Singer: Anna Netrebko. Orchestra: Orchestra del Teatro Regio di Torino. Conductor: Gianandrea Noseda. Singer: Anna Netrebko. Singer: Yusif Eyvazov. Singer: Yusif Eyvazov. Orchestra: Münchner Rundfunkorchester. Conductor: Marco Armiliato. Performer: Cecil Aronowitz. Performer: William Pleeth. Ensemble: Amadeus Quartet. Performer: Terry McKenna. Singer: Daniel Thomson. Performer: Sylvia Schwartz. Performer: Malcolm Martineau. Performer: Malcolm Martineau. Performer: Sylvia Schwartz. Performer: Janine Jansen. Performer: Maxim Rysanov. J.S. Bach: Inventions and Partitas: Janine Jansen.